Want to buy a pair of stadium seats? A boxing ring? A scoreboard that flashed above thousands of Detroit Lions and Pistons games? 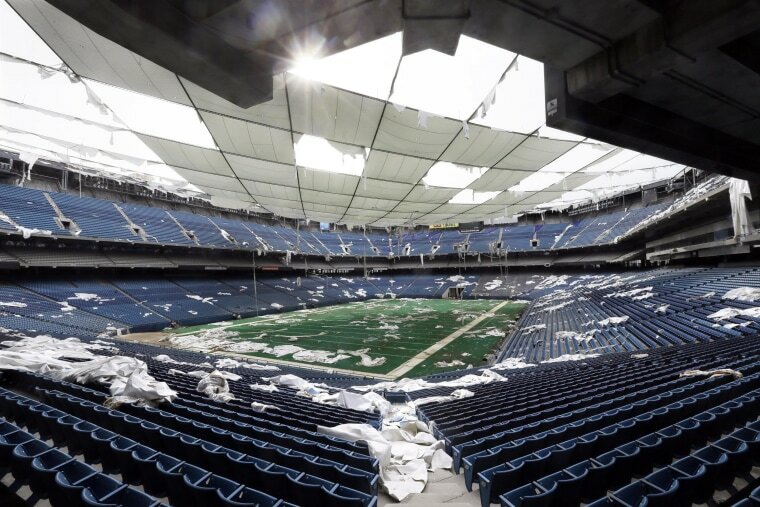 The Silverdome in Pontiac, Michigan has not hosted a football game, or any other event, since 2001 and is falling apart. That's why its owners are putting everything inside the 80,000-seat stadium on the auction block. Among the 4,000 items available for bidding are pretzel warmers, a boxing ring, a Zamboni turf machine, flat-screen televisions and scoreboards. A pre-auction sale of Silverdome seats is already underway, with prices ranging from $100 for a single seat to $365 for four adjoining seats. Triple Investment Group LLC, which acquired the Silverdome for just over $500,000 in 2009, hasn't said what it intends to do with the actual building, which is falling apart. The Silverdome was built in 1975 and hosted not only Lions and Pistons games, but a Super Bowl, an NBC Finals, a 1994 World Cup match between the U.S. and Switzerland and even Wrestlemania. Elvis Presley played there, Led Zeppelin and the Rolling Stones. Pope John Paul II prayed under the dome. A marvel of 1970s-era engineering, the stadium covered by a 10-acre, Teflon-covered roof supported by air is now a shell of its former self. The unforgiving Michigan weather shredded its roof, long strands of which hang from high above or are crumpled on the floor. Without electricity, the stadium's innards are dark and mold-infested. The weed-covered turf, on which Barry Sanders once made tacklers look silly, is floating on a foot of water like an oversized lily pad. The Silverdome's auction includes the old scoreboard used by the NBA's Pistons, as well as a section of the end-zone turf used by the Lions before the NFL team moved to Ford Field in Detroit in 2002. And while Passeno has heard from a number of Elvis fans clamoring for memorabilia related to the King's show here, alas, it has left the building. Still, time is running short to take home a piece of Silverdome history, Passeno said. "The assets are just getting destroyed by this open-air environment," he said.